← An eloquent appeal to save Hardwood Hill in Nova Scotia’s Annapolis Co.
That comes on top of the CH changing to a new platform in mid-September and not providing access to older content, making many links to CH items published before mid- September 2018 non-functional. That’s a big issue for nsforestnotes.ca where I have attempted to provide “a [public] record of events, news and opinions on the subject of forests and forestry in Nova Scotia as they unfold, beginning on June 21, 2016” and many of the news links on this blog/website are to items in the Chronicle Herald. I inquired back in September about the old links, and the CH said they are working on it. I made a more recent inquiry by phone and they said they would get back to me but have not. I suspect that even if they do resurrect the old links now, a paid subscription will be required to access them. The Chronicle Herald is a rarity these days, one of the few independent newspapers left in Canada and, except for a lapse during the strike, I have been a subscriber for over 40 years. The quality of journalism was clearly wanting during the strike, and it clearly improved when the strike was resolved. I resubscribed to the print edition for a while but was overwhelmed by the amount of paper and switched to a digital subscription. I have been happy with that, and also appreciated that much of their content, perhaps most, was made available online, some of it just not right away. I can understand that the Chronicle Herald faces the challenges all such media face today, notably the devaluing in general of ‘good journalism’ and that they need to generate income. However, for the sake of their role in the community, I think the CH could come up with a better model, e.g., allow most of the news to go public after one-week, or use of time-lapsed ads (e.g. as on a lot of CBC videos). 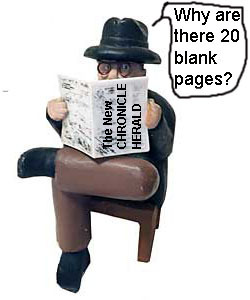 As it stands now, with older links being completely unavailable, and newer ones requiring payment, I likely will not be referencing the Chronicle Herald on nsforestnotes.ca in the future. I am more empathetic to the Halifax Examiner’s charge for access to their content ($10/month) because (i) subscriptions are their sole source of income and (ii) it often includes in depth, thoroughly researched investigative content of interest to me such as Linda Pannozzo’s series on Biomass, Freedom of Information, and the Silence of the DNR Company Men. Several times in a year I pay the monthly fee ($10) to access such articles. As much as I might like to support the Halifax Examiner on an ongoing basis ($10 x 12 months), such expenditures come from the pot I use to support a range of interests/charities etc and I can’t do it without giving up something else, so the ‘pay when you really need it’ is a compromise. I have suggested to Tim Bousquet that he could charge for individual articles, making the fee low enough (e.g. $5) that most people who want to see a particular article wouldn’t hesitate. He has replied respectfully to my suggestions but for the moment, at least, such a model won’t work for them. In contrast to the Chronicle Herald, the Halifax Examiner makes a lot of its content publicly available after a period of several months, for no other reason I can see than as a public service. Thx Tim. I suppose the CH could do the same and charge per individual article. But then they would have to put a lot more into the investigative component of their news to make such purchases worthwhile… and then the CH would be competing in my pot with… the Halifax Examiner! Regardless, there is still a need for a secure, long term, public record of goings on, opinions etc. in Nova Scotia. The Chronicle Herald filled that role for many years and, for a period, seemed to make the transition to the Internet Era and still serve as a public record and forum. Evidently, that model didn’t work for them. Unfortunately the current model – with older links being completely unavailable, and newer ones, even opinions, requiring payment – doesn’t work for Nova Scotia Forest Notes. I apologize to readers of nsforestnotes.ca for the many links to Chronicle Herald content that are now no longer publicly available. I will leave them there as a (frustrating) record of what was once news in the public domain about forests and forestry in Nova Scotia. If you get a subscription, you may be able to access some of those items, but then again, for pre-mid-Sept 2018 items, you probably won’t. So now I just have to figure out how to cancel my electronic subscription to the Chronicle Herald and put the $ back into the interests/charities pot. This entry was posted in Social Values. Bookmark the permalink.